T-Mobile has launched the Motorola RAZR V3t. Despite a new model number, the V3t is simply a V3i branded for T-Mobile. Cingular launched the V3i to little fanfare last month. T-Mobile is selling the RAZR V3t for $149.99 with a 2-year service contract and $50 mail-in rebate. In a related release, T-Mobile is also selling the limited edition Dolce & Gabbana Gold RAZR V3i. It has the same features as the V3t and is selling for $299 with the same contract and rebate. Both phones support MyFaves. 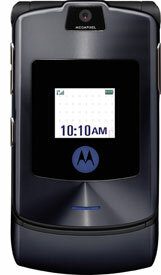 Two more images of the RAZR V3t are included below.